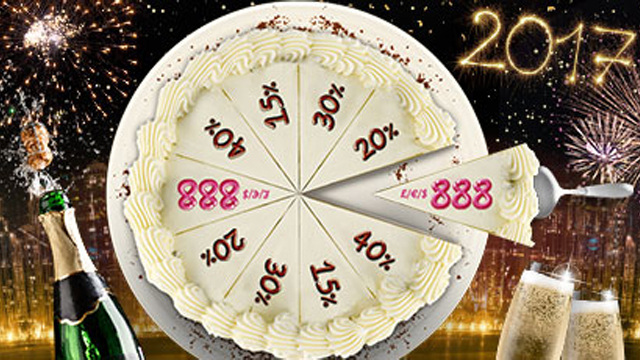 Celebrate the new year at 888 Casino this January with a special promotional cake, with prizes of bonuses and free play to be won. The top prize every day is a staggering £888 in free play. To take part in this promotion you must first make a deposit of £20 or more, being sure to use the promotional code, NYECAKE when you do. This will then entitle you to a spin on the New Year’s Cake. You are entitled to one spin of the cake every day until 8th January 2017. The cake is divided into slices, each representing a different prize value. Prizes range from deposit bonuses of 15% up to 40% and the jackpot prize of £888 in free play. There are some important terms and conditions to bear in mind if you take part in this promotion. Firstly, any freeplay you win will be valid for 14 days only, after which time it will expire. Additionally, your bonus and any winning resulting from your bonus will be subject to a 30x wagering requirement before any withdrawals can be made. Finally, your deposit bonus, should you win one, will be capped at £400. 888 Casino is a favourite of ours here at Offersville. There is a huge range of games to choose from, including favourites from market leaders like NetEnt and Wagerworks. And should you choose to play at this mega casino, you can be sure you are playing with one of the most trusted names in the business, licensed and regulated out of Gibraltar. 888 Casino is also approved by the UK Gambling Commission. You can find out more by reading the Offersville 888 Casino review.